And then they realize what a dumb jerk you really are. SOUTH CAROLINA– We’re still down here in South Carolina, where the sandy soil and warmish temperatures bring horse riders from up and down the East Coast. Your editor’s wife is a competitive rider. He follows her here and hangs out at coffee shops and hotel lobbies, looking a little like a man with nowhere to go. Friday, a group of motorcycle riders roared through town. Harley Davidson has to be a good company to sell, we thought to ourselves. Every one of the riders was fat, with a gray beard. The customers must be dying off. “I kinda like Trump,” said one older man to a group of other retirees. “Well, I don’t like Trump because he’s so vulgar,” added the only one who had not hitherto expressed herself. “He’s like Hitler,” said the one concerned about the wall. No matter who’s talking – candidates or voters – it’s impossible to listen carefully and still believe in democracy. We don’t usually pay any attention to politics. But this is an election year. And this year’s election is especially entertaining. It is naked politics. 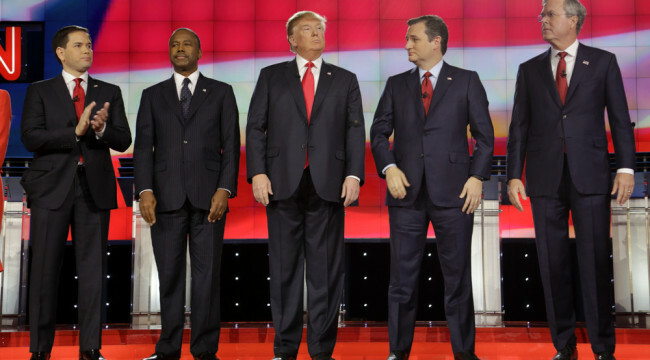 The candidates have shed their respectable clothes; we see them as they really are. Now on view: the worst of a bad species. Paunchy prejudices… weak, spindly policy ideas… flabby spinelessness… cowardice… vulgarity. They are worse than we hoped for… and no better than we feared. One has sold his soul to the Deep State. One seems to have no soul to sell. Another will say anything… and then deny he said it. Readers just joining the conversation should know where we stand: Elections are insipid rituals. They have little to do with the way the country is governed. We watch the campaign like peeking over a jungle bush, observing a stone-age tribe throwing virgins into a volcano: We doubt it will prevent the next eruption. But when mankind gets up to high-stakes mischief, there is always something to gawk at. In the news last week was a new survey of billionaires. Where do they come from? How did they get their money? The survey reveals that the old money based on manufacturing and retail are fading; fewer of today’s big fortunes come from inheritances than 10 years ago. Who’s getting super rich in their place? People in “finance” or with “political connections.” The Deep State insiders, in other words. Yes, the voters may have their say on gay marriage, banning the Confederate flag, or prayer in the schools – the Deep State doesn’t care about social issues. But when it comes to power and money… the voters may as well stay home. If there’s a big budget involved, lobbyists, cronies, think-tank hustlers, assorted chiselers, zombies, and mythomaniacs pull the strings. So, it doesn’t matter whether Trump or Clinton wins in November; either way, you lose. The power elite know no national boundaries, either. London-based newspaper the Financial Times is one of the leading propagandists for the Deep State. The Fed sends billions of dollars to foreign banks, as well as to American ones. Reagan. Bush. Clinton. Bush. Obama. It didn’t matter whom voters elected, the trend was the same: Money and power flowed from the productive Main Street economy to the Deep State and its financial economy. It didn’t matter whether the man in the White House said he believed in “liberty” or in “equality,” either. The shackles grew heavier every day. In 1980, there were 3,000 federal crimes. Today, there are 4,500. And the number of pages in the Code of Federal Regulations has swelled by 80%. The grease increased, too – with the number of giveaways, subsidies, privileges, insider angles, and payoffs rising every year. The Food Stamp Act, for example, began in 1964 with $30.5 million. Now it costs 2,400 times as much. Education expenses have soared too. A typical third-grade class now costs $220,000 a year… $175,000 of it for salaries. What do you get for that kind of money? Are students today better educated than they were 100 years ago at a fraction of the cost? Health, education, Wall Street, and “security” are the major Deep State industries. This is not to say that every stockbroker or every soldier is a malingerer or a cheat. But the Deep State’s lobbyists and cronies rig the system, so you pay far more than you need to pay and get far less. Wall Street used to account for only 10% of the nation’s business profits. Now it is three times as much. “National security” now costs $1 trillion a year – despite the fact that the Pentagon has no enemies, it did not create through its own boneheaded foreign interventions. Healthcare in the U.S. costs twice to 20 times as much as it does in other countries – for no apparent benefit. Where, then, does all the money go? To the Deep State and its clients, of course. Our modest contribution to Deep State studies is to figure out the squirrely role played by the Fed and the post-1971 dollar. Not for nothing do we have such a preposterous financial system. The borrower buys things he doesn’t need with money he doesn’t have. The lender lends money that no one ever earned or saved, at the lowest interest rates in history, to borrowers who can’t pay it back. And everyone with any sense holds his breath… waiting for the day of reckoning that never seems to come.